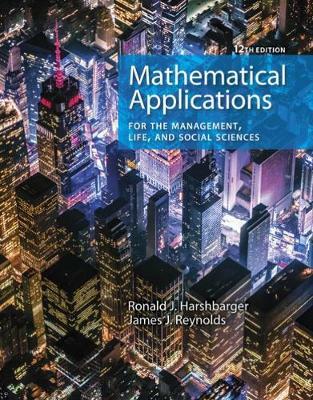 MATHEMATICAL APPLICATIONS FOR THE MANAGEMENT, LIFE, AND SOCIAL SCIENCES, 12th Edition, helps students succeed in finite mathematics and applied calculus courses by tying the concepts to real-life applications using real, meaningful data. Designed for students majoring in business, economics, life sciences and social sciences, the book offers a brief review of algebra to prepare students with different backgrounds for the material in later chapters. Chapter Warm-ups review the prerequisite topics for each chapter, and Checkpoints ask questions and pose problems within each section's discussion--allowing you to check your understanding of skills and concepts before moving to the next chapter. Use of technology is integrated into the text, and optional modeling problems are discussed. Student resources include a Student Solutions Manual and online homework with WebAssign.